We’d love your help. 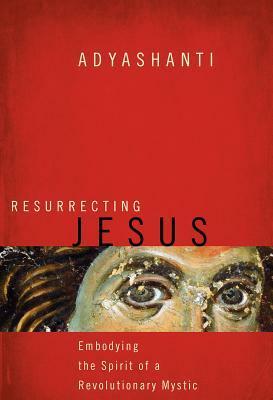 Let us know what’s wrong with this preview of Resurrecting Jesus by Adyashanti. To ask other readers questions about Resurrecting Jesus, please sign up. I felt like this book described the steps of spiritual awakening and then illustrated HUMAN Jesus's journey to enlightenment throughout the Gospels, but not HOW to achieve this personally. I want to too! Only gave this book a 3rd star because of the final Part Three of the book. I'm glad I read this, and it definitely did have some sections worth thinking about, even discussing with my kids maybe as a subject for the dinner table, but just never got really excited about this book. I kept thinkin I felt like this book described the steps of spiritual awakening and then illustrated HUMAN Jesus's journey to enlightenment throughout the Gospels, but not HOW to achieve this personally. I want to too! Only gave this book a 3rd star because of the final Part Three of the book. I'm glad I read this, and it definitely did have some sections worth thinking about, even discussing with my kids maybe as a subject for the dinner table, but just never got really excited about this book. LOVED this book!!!! A refreshing and realistic view of Jesus from a Zen Buddhist perspective. I wish I was taught Jesus in this way as I was growing up and many in my church's spiritual growth group expressed the same wish. Thank you so much for writing this book Adya!!!! One of the most personal, beautiful and fascinating books I've read about Jesus, written by a Buddhist who sees with open eyes and heart. My minister once told me that I was a mystic. Intrigued, I wanted to hear what Adyashanti had to say about Jesus. The words hit all my buttons. An interesting non-dual, Zen oriented take on the life and teachings of Jesus. Would recommend to those who are familiar with Zen or Dhyana Yoga and are interested in Jesus Christ. I would further recommend the first volume of the Philokalia for an early Christian version of Zen by the Desert Fathers. A new understanding of this historical figure that eliminates the layers of institutional religion. Adya eloquently models through Jesus, to those interested in the path of knowing one's true self, to use the Jesus story as a road map to one's own quest of understanding their own true nature. Beautifully written. Things finally came together for me in the story of Jesus. I’ve always felt there was more to the Jesus story than was being told. Now I know what that is. The lady who wrote the foreword was not exaggerating when she said that the author was an amateur at best. But when one has achieved a certain level of fame, I guess one can choose to write on anything. Excellent. Very good to read the life and significance of Jesus written by someone not primarily calling himself a Christian - yet deeply identifying with the mystical meaning of the historical Jesus. I found it both freeing and challenging. The author asks us to look at the life of Jesus through Buddhist eyes. I think we always learn something new when we view our Christianity through other eyes. For the most part I agreed with him although there are theologians who wouldn't. He did have some excellent points however. I read this as a group discussion. Adyashanti shines a new light on how Jesus is portrayed, as a man. The central archetypes of Jesus, - Peter, Mary Magdalene, John, Judah's, and Pontius Pilate - how they related with the spiritual impulse within us. Worth reading again and again. Mystics united :) Zen, Buddhists, Christian. Colours don't matter. Wake up! wonderful read, highly recommend this, provided new insight into understanding Jesus beyond what has been taught mainstream . . . loved it! Excellent book! I think I stumbled upon this book while searching for "buddhism". The title intrigued me for some reason and reading the description I felt it would be a different book to read. To be sure, everything in this book would be considered pretty radical by most Christians. But to me and others like me it is radical in a very good way! I loved that he has roots in both traditions and uses both perspectives to inform the other. I also love that he approaches the story from a mythologica Excellent book! I think I stumbled upon this book while searching for "buddhism". The title intrigued me for some reason and reading the description I felt it would be a different book to read. To be sure, everything in this book would be considered pretty radical by most Christians. But to me and others like me it is radical in a very good way! I loved that he has roots in both traditions and uses both perspectives to inform the other. I also love that he approaches the story from a mythological perspective and exploring myth as a spiritual exploration and experience. He does not push that the stories are myth or history or a combination of both but simply believes that we can learn and grow by reflecting on the people and their place in the stories. By doing this it's meant to be a personal experience where we directly experience spirit rather than it being removed and held away as a system of control and power. A very insightful book and one I shall go back to! But at times there were things that rubbed up against me the wrong way. I felt there was an underlying basis and almost an extreme expectation that applying the story of Jesus in this way would make our pain go away. Or that if it doesn't then that is ok because the only way our pain can go away is when we become truly enlightened. At some point I realized that it caused me more suffering to expect something like enlightenment to erase all of my pain or need for human love and connection. At times the pedestal that Jesus was held up so high on caused me pain because to me Jesus was a human being. Though that is the basis for this book Jesus I feel like there could have been more exploration of Jesus as a human being. And because of that though the book was interesting and insightful there was something missing and a little depressing about the book. Resurrecting Jesus was a powerful read. I saw, no, I felt, Jesus - his life and his meaning (which really are not two separate concepts) - and it was so refreshing, so invigorating, so immediate, so.... The book gave a perspective (for lack of a better word) that presented me with a totality of the human-divine named Jesus. As Adyashanti explained: "Through this book, I hope to bring forth part of the Christian story that has been lost to some extent - that sense of Jesus as a vital spiritual re Resurrecting Jesus was a powerful read. I saw, no, I felt, Jesus - his life and his meaning (which really are not two separate concepts) - and it was so refreshing, so invigorating, so immediate, so.... The book gave a perspective (for lack of a better word) that presented me with a totality of the human-divine named Jesus. As Adyashanti explained: "Through this book, I hope to bring forth part of the Christian story that has been lost to some extent - that sense of Jesus as a vital spiritual revolutionary. This Jesus comes not so much to comfort us as to confront us..... breaking through all the boundaries... " And Adyashanti spelled it out so clearly. He helped me to understand Jesus' words: "The Kingdom of God is spread upon the earth, and men do not see it." I had tried to read this book before and quit. I think it was because I was prejudiced by the title. At the time I picked it up, I was avoiding most "Christian" books and this one struck me as just another Christian book. I restarted the book (Had even to re-buy it because I had given it away) because of joining a study group who were reading it. My second reading was more fruitful. I was open to the fact that this author, not a Christian clergyman, was seeing the value in the gospels and explai I had tried to read this book before and quit. I think it was because I was prejudiced by the title. At the time I picked it up, I was avoiding most "Christian" books and this one struck me as just another Christian book. I restarted the book (Had even to re-buy it because I had given it away) because of joining a study group who were reading it. My second reading was more fruitful. I was open to the fact that this author, not a Christian clergyman, was seeing the value in the gospels and explaining the stories in a mythical sense. Much more meaningful to me at this point. A brilliant recasting of the Jesus story as an adventure in awakening to the true Self. Set in contrast to the still, quiet Buddha nature odyssey, Jesus reveals what life is like upon awakening and choosing to engage in the world. While both are absolutely necessary, Resurrecting Jesus is an invitation to revisit the West's foundational story with new eyes. This book was not original in concept or theory, but I had not read it discussed so thoroughly. The author goes through the life of Jesus and dissects it as a myth, comparing and contrasting it with a Buddhist perspective. I really enjoyed this book very much. Adyashanti provided a perspective on the life of Jesus and what it means for each of us is a very unique and spiritual way. One does not have to be a Christian to find a deep spiritual journeying within this book. 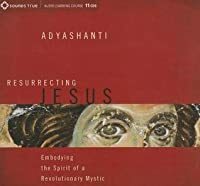 From an American-born spiritual teacher with a Zen Buddhist background, Adyashanti offers a very thought provoking way of understanding the timeless essence of the Jesus story. One of my favorite lines toward the end of the book is, "This Jesus comes not so much to comfort us but to confront us." A wonderful, more mythological approach to the story of Jesus, in which Adyashanti explains how this story is a blue print for us to use in our spiritual quest to become more whole and divine human beings. "...keep your feet firmly planted on the soil, keep your consciousness and heart open, and stay available to this relative world and all the human beings in it." Adyashanti is an American spiritual teacher from the San Francisco Bay Area who gives regular satsangs in the United States and also teaches abroad. He is the author of several books, CDs and DVDs and is the founder of Open Gate Sangha, Inc. a nonprofit organization that supports, and makes available, his teachings.